This is one of the most problematic of our studies, and yet one of the most hopeful. The dimensions of forgiving grace have been limited by some while still touting the “completeness” of His forgiveness Heb. 7:25-28). Forgiving grace has been abused by others (Romans 6:1-2), and misunderstood by other who know the meaning (unmerited favor) but fail in the application of this marvelous outpouring of God’s love. Forgiving grace can also be un-believed by others who feel they are beyond His loving hands. Whether LIMITED, ABUSED, MISUNDERSTOOD, OR UNBELIEVED… the result is the same, limited joy and success in the Christian life. Everyone wants to be forgiven, yet fail to realize the “give and you will get” principle tied to it (Matthew 6:14-15; 18:21-35). Forgiving grace IS AT THE HEART OF GOD’S GREATES GIFT – JESUS! Bible forgiveness is to (a) GRANT FREE PARDON (this is grace), and (b) STOP FEELING RESENTMENT (Part B is harder and takes more time because of the healing process. Forgiveness is THE BEGINNING OF HEALING.) BOTH ARE OF EQUAL IMPORTANCE TO THE PROCESS!!! Both are critical to this gift of grace and both involve the head and heart of the one wounded. To offer “free pardon” to an offender, with no ifs, ands, or buts attached is pure grace (cf. Lk. 15:11-32). To “stop feeling resentment” is the crowning blessing of forgiving grace. This is grace – pure grace – God’s grace – and He offers both to all (Revelation 22:17). THERE IS A “BALM IN GILEAD” (Jer. 7:22). Healing is offered freely, which enables the forgiven, to extend this grace to the one who wounded him/her. THE FIRST GRACE EXTENDS LIFE TO THE WOUNDED AND THE SECOND GIFT REVIVES LIFE IN THE WOUNDED. BOTH ARE ESSENTIAL – IMPERATIVE – ABSOLUTE, for one without the other leaves the problem only HALF SOLVED! True FORGIVING GRACE is a paradigm shift for many if not all Christians! When Paul says, “Therefore, since we have been justified through faith, we have peace with God through our Lord Jesus Christ, through whom we have gained access by faith into this grace in which we now stand. And we boast in the hope of the glory of God” (Romans 5:1-2)… he simply mentions GRACE, this includes, FORGIVING GRACE!!! 1. FORGIVENESS IS NOT FORGETTING! Well IF WE CANNOT FORGET, then how can we deal with the bad thoughts and memories that keep bothering us all day and night? The key word here is “bothering”, and the answer is found in 1.) forgiveness and 2.) learning a lesson making changes 3.) focus on the present and future and not the past. A. The human brain is not made to forget, if it could, lessons would not be learned. C. We are disciples (learners) not forgetters, and some of the greatest lessons, and times of growth comes from situations where there are heartaches and stress. BESIDES, WHEN GRACE IS EXTENDED TO THE TORMENTOR, HEALING GRACE IS GIVEN TO THE TORMENTED. DON’T FORGET… LEARN, GROW AND REJOICE IN THE GROWING. Here we find a WIN-WIN situation. The forgiver is not tied to the past, and the offender is free as well. B. Paul says, “Do not repay anyone evil for evil. Be careful to do what is right in the eyes of everyone. If it is possible, as far as it depends on you, live at peace with everyone. Do not take revenge, my dear friends, but leave room for God’s wrath, for it is written: “It is mine to avenge; I will repay,” says the Lord” (Romans 12:17-19). C. FORGIVENESS IS THE ONLY HOPE FOR THE OFFENDED AND OFFENDER. D. God is more interested in the OFFENDED that the OFFENDER, especially if the OFFENDED is a Christian. He wants His child to heal, grow, and be protected against bitterness. God will protect and restore the wounded before he will help the one who crushed him to the ground. Both need help, but God will BEGIN with the one who needs it most. So if you have been wounded, forgive freely, it’s your only hope. A. Yes! It is necessary for one to repent and ASK for forgiveness (and receive it) before forgiveness to be complete, but even if someone is mean, doesn’t ask or want your forgiveness… (You can’t make a person “be sorry” or repent), but THE OFFENDED, THE HURT PERSON CAN FULLY PREPARE THE GIFT OF GRACE and even if it takes a lifetime… can be prepared to give the gift. B. Consider WHY this is important. It wards off BITTERNESS in the heart as one says in his/her heart “I FORGIVE YOU ANYWAY”. It maintains your communion with God and doesn’t block your prayers (as Bitterness does). It allows you to continue growing in grace (2 Timothy 4:16-18). 2.) Where trust is broken, and there is fear of repetition, be cordial. 3.) Boundaries are critical. Determine what actions can and cannot be tolerated. Bad actions don’t have to be tolerated. Bad people don’t have to be allowed in your inner circle. But you have the Holy Spirit to help you treat this person right. 4.) When boundaries are crossed, be assertive and deal with the action in such a way that you don’t have to look back and ask yourself, “Did I do wrong.” Maintaining a stand on certain things is not wrong, it’s how we do it that makes all the difference. 5.) Matthew 18:15-20 deals with a brother who sins against you…. Matthew 18:15 “If your brother or sister sins against you, go and point out their fault, just between the two of you. If they listen to you, you have won them over.” How it is done, makes a lot of difference. 6.) Don’t put off dealing with problems…. They just get worse! 4. THE UNFORGIVER IS UNFORGIVEN. A. I don’t like this one. Yet it is plain. I cannot tell you when God will reject the Christian who is an un-forgiver. Yet Jesus is plain, “But if you do not forgive others their sins, your Father will not forgive your sins” (Matthew 6:15). This one will eventually be lost. Matthew 18:21-35 gives a more graphic story concerning this. A. “Let’s just forget it!” “Let’s bury the hatchet!”, “I’ll just move to another congregation!”, “Let’s just get re-baptized!”, “Let’s just pray about it!”, “Let’s just say it never happened!”.None of these things will work!!! None of these things takes the place of forgiveness… ASKED FOR AND RECEIVED FREELY. B. Who is called on to do the restoring? An elder? Deacon? Minister? NO! The spiritual (filled with the Spirit) brother or sister in Christ. C. Is this easy? No! Yet it must be done. Would you allow an amateur to operate on your physical heart? Would you want a beginner to operate on your brain? Forgiveness probes deeply into the heart… only the spiritual can expect to succeed, (Ephesians 4:32). Jesus paid the full price of our sins as well as others. How would God see you without Jesus’ cleansing blood? We owe Him so much and yet He forgives….. This is FORGIVING GRACE! GROW IN GRACE… NOT BITTERNESS…. When we were in Ireland with mom and dad… I learned to drive. Driving over there is not hard as long as you stay on the right side of the road. All learners receive and are required to display a rather large decal on the front and back windscreen (window). It is approximately 6 inches by 6 inches, and has a white background, with a big red “L” which stands for “Learner”, displayed. On the other side of the decal is another red letter… “R” which stands for “Restricted”. I was a “learner”. Rather sheepishly, dad and I would go out and I would practice. The roads are narrow… When we saw an American car over there, which was rare, we couldn’t help but notice that it took up most of the country or back roads. I could not figure how they drove over there because the steering wheel was still on the left side. The steering wheel is on the right side in British cars. As usual, dad was issuing orders and warnings as I tried to drive. Since the car we had was not a car, but a MINI-VAN, the gear shift was on the floor, and I had to learn how to shift gears smoothly, not hit anything or anybody, stay on their right side of the road, follow and observe the signs (which were different) and remain calm all at the same time. I had to watch the speed limit, and learn to back up, park, pass and a dozen other things…. There were times when we were coming to a stoplight, and it was green but then it turned yellow and then red, and it seemed to dad that I was not stopping fast enough for his comfort, so he would say, “stop Jack”… “Stop Jack!”… and then “STOP JACK!! !” So I did… but I would forget that I needed to push the gear shift peddle as well as the brake, so the Van would stop and not turn off. Eventually I got it. Learning all these things was not easy, but it was exciting. We always returned home safe. Well, one day we were on the way to church I believe and dad decided to drive. All went well until he turned onto a dual carriageway (high way). No problem… except he had forgotten about the cardinal rule of being on the right side of the road. Cars were coming at us all of a sudden. Then it happened, the cars coming at us all came to a screeching halt, and doors flung open, and a bunch of Irishmen came running at us, waving their fists… and yelling something… Dad always said, “The Irish have big hearts and short fuses.” He is right. Dad always was a quick thinker, and in an instant he remembered the Red “L” on the windscreen… He quickly pointed to it, hoping it would help. It did, The leader of the ‘mob’ stopped everyone, and said, “Ak (Irish for something, don’t know what), he’s just a learner.” He took charge and said, “Everyone get back in your cars, and let him turn around.” They directed dad where to turn and help direct the traffic. Finally we were on the right side of the road. Dad carried that red “L” with him from then on, and used it all over the world to teach a simple but profound lesson… AS LONG AS WE ARE ON THIS EARTH, WE ARE LEARNERS. Things change, and so do people… if we give them time. WE NEED TO MAKE ROOM FOR EACH OTHER… Paul says, “Accept him whose faith is weak without passing judgment on disputable matters” (Romans 14:1). “Accept” carries the idea of BEING PATIENT AND LOVING, AND HELPFUL. Then in Romans 15:1-2 Paul says, “We who are strong ought to bear with the failings of the weak and not to please ourselves…. build him up” Just like our Master (Romans 15:3). “Accept one another, then just as Christ accepted you….” (Romans 15:7). This doesn’t exclude the idea of correcting each other, but that should be done with love as well. The present practice of ‘black-balling’, ‘labeling’ is not what the Master had in mind in my opinion. Jesus deals with us differently than we deal with each other. Think about it, Jesus came to this world and shows us who? “God” you say correctly. What about the disciples… who do they show us? Often we are stumped here… but the answer is “US”. How Jesus dealt with the disciples, shows us how he deals with us. This is one thing we see all through the gospels. He knows we are weak, sinful, emotional, cranky, depressed etc… He knows we sin, and sometimes in a big way… but he doesn’t quit on us. John says in I John 1:9 “… He is faithful…” He knows we are learning. Sometimes we learn kinda slow, while other times we are quick. Keep in mind not everyone learns at the same rate. The Gospels are all about this very thing… Jesus invests precious time in 12 learners… teaching, correcting, loving, laughing, sharing, commissioning, empowering, setting an example for them… because one day He would be leaving them. No, they wouldn’t be alone, they would have the Holy Spirit, and He would bring all things which Jesus had said to their memories. Learners… disciples…. and it doesn’t matter whether you are an elder or deacon or minister or teacher… it matters little if you have one or more gifts from the Spirit… the most important thing to remember all your life, is ALWAYS… BE A LEARNER. Grow in grace brethren… Heaven bound! Good question! There are a lot of good people out there and obviously not all go to the same church. Just for a moment, lay aside the preconceived ideas and give room for some good old fashioned thinking. The problem many are lacking is ‘balance’. FALSE TEACHING COMES WHEN TRUTH IS ‘PUSHED’ TO AN EXTREME. Over the years, I have changed some beliefs which I held for a long time simply because they were out of balance with other plain scriptures. I was guilty of looking for verses to prove what I had believed, in spite of the fact that context and the first rule of interpreting the Bible (“THE PLAINEST THING IS THE MAINEST THING”), didn’t really support what I thought was right. Often times I over-looked this, and just preached on, because I was young, inexperienced, traditions were pretty strong, and I didn’t want to get ‘fired’ or ‘black-balled’ by other ministers. Friends, it matters very little whether you fall out of the boat on the left side or the right side…. your still out of the boat! The real question a person needs to deal with when studying the scriptures is never WHO IS RIGHT (since this leads to arguments)… but WHAT IS RIGHT. Then all that’s left is ATTITUDE… Are you really searching for truth no matter where it leads… or not? Are you willing to make the changes that being a disciple of Christ demands? Jesus said, “I AM THE WAY, THE TRUTH, AND THE LIFE. No one comes to the Father but by me” (John 14:6). “ Jesus said it, that settles it!” Even though it takes courage to change, it is worth it. It doesn’t mean everyone will like you… but not everyone liked Him either (John 15:18-19; 16:1-4). “Redeemed” In Telugu Is Available! 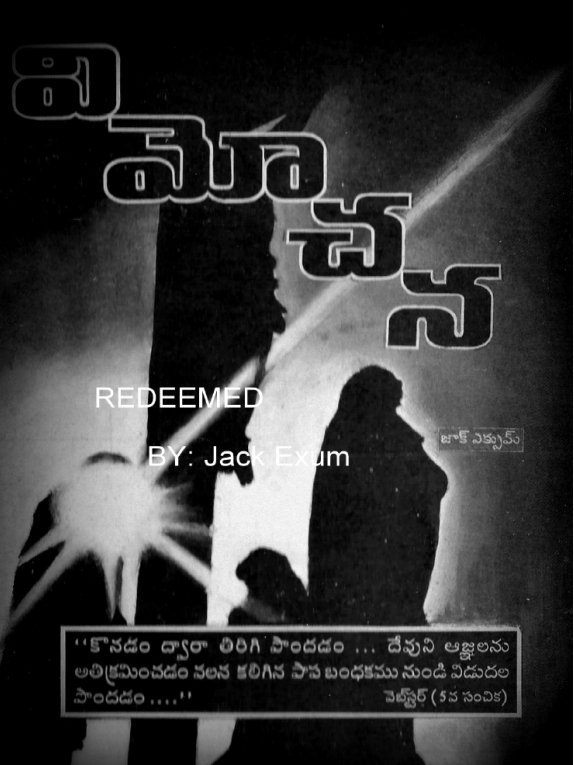 “Redeemed” is now available here on jackexum.com for all who speak Telugu. This is available free of charge for one and all who wish to study the Bible in this native tongue on India. God bless you!!! Redimido – “Redeemed” In Spanish – NOW AVAILABLE!!! This is FREE of charge for any and all who wish to study God’s plan for Redeeming man in the Spanish speaking countries!!! God bless you…. GIVING is a grace… not a law. Not like under the Old Testament Law. New Testament: Tithing is not a command… WHY? Answer is found in GRACE! 1. Giving is a grace not a law. It is tough to try and legalize grace! 1.) Joy is taken out of the grace. 2.) Guilt comes back with the ‘law’. attitude. (Hypocrisy destroys this grace) Not the way to grow in grace! (Matt. 3.) “to give” This is a voluntary – no force/ JUST LET HIM GIVE! Enjoy! motive beats all others… GRACE! as well. When a need is presented… grace will respond. 3.) Idea = not to divorce this grace from others… GROW IN GRACE = all of life! 4.) Result of Holy Spirit in life (create Christ in us). B. Promises made: 2 Cor. 9:8, 10. 3.) We have taught SOWING, GIVING… but not REAPING. a.) If you want good things to come into your life… what we need to do? b.) Want people to visit/call/send cards to you… what we need to do? 5.) Wherever you are in this Grace… begin to GROW! “Liberal” (9:13), 14.) “Unspeakable gift” (9:15). I found this news paper clipping amongst dad’s papers…. Word for word… here it is! And just what she has meant. To a day in ’32. Three better sisters you could not find. At home the whole day through. Wondering why it had to be. Crowned her mother, “Queen for a Day”. On this our Mother’s Day. And that’s the sad part of it all. Our remembrance of you, dear mother. “Greetings to you all from the mission fields that are truly green (in Ireland) instead of white. I have never been busier. Each week I have from six to ten cottage film meetings and with this years itinerary, we are facing long hours. The school for evangelists and Bible teachers began this week with twenty five in attendance. Our regular services, plus two special classes at the nearby boy’s club keeps us moving. Our first annual all-Irish lectureship will come in April. Next month I will be in Scotland for a worskshop. Charles Hodge from Ft. Worth, will be with us in a campaign this summer, and out Bible camp, called, “Camp Shamrock” is open for two weeks in August. “Two were baptized this week, three converted last week, and two the week before, and one before that. In fact, week by week – even day by day- people are coming to Christ. Why put this little note in the web site? Well to show just how important supporting congregations are and the results which can come when the relationship and communication between missionary and supporters are good. Hard work on the part of missionaries can never be over estimated. not all fields have the same results… but when Jesus is preached, people respond.